BETTER SWING DYNAMICS. Get a better analysis of players stance, eye tracking, and swing as they watch the ball come down the line. Without the fear of getting pegged by a fastball, you can fully focus on your players technique, as you set them up for success for their in-game hits. BATTING PRACTICE. WITHOUT A PITCHER. The Baseball Trainer is a great training aid to improve swing pace, level, and timing. It’s the perfect batting trainer that "throws" curveballs, sliders, and changeups. Now you can get batting practice with all types of pitches, without needing a pitcher. COMPACT AND PORTABLE. Imagine a portable batting cage that fits into the size of a baseball glove. 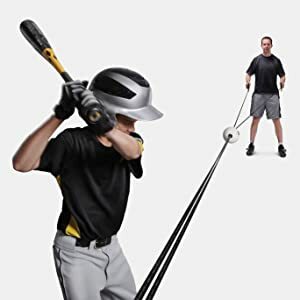 That’s what you get with the portable Baseball Trainer. The attachment clip and strap make it easy to practice almost anywhere. EASY TO USE. It doesn’t matter if you’re coaching a team, or working with your all-star child, the proper equipment will make your life easier. Simply pull the cords apart to “zip” the pitch down the line. 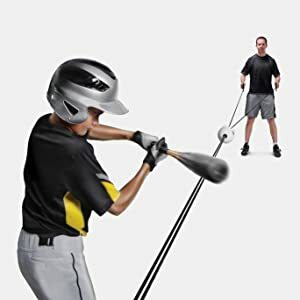 The batter can adjust their stance, power, and swing as you prepare them for game day. Pitcher should hold handles firmly, keeping cords tight with as little slack as possible. Starting position of the ball is near the handle end of the cords. To 'pitch' the ball, assume a solid stance. Pull the handles evenly apart and slightly back, keeping the cords pulled tightly throughout the duration of the pitch. Pitch speed varies with the force used to pull the handles apart. Advanced Edition's rope is more malleable and elastic than Junior Edition.In addition, baseball, the Advanced Edition is better than Junior Edition USES material, durable.